The night sets its star-spangled veil on old Cairo, as a delightful tune rises above the ramparts of the Citadel. The alluring melody is a blend of folk, jazz and more, an intriguing cultural fusion between East and West, old and new, bringing life to the ever-symbolic landmark. 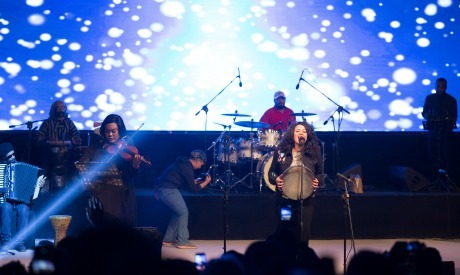 The Hakawateya (storytellers) concert, featuring independent Egyptian musician Dina El Wedidi and American violinist Chelsey Green and her band The Green Project, was held on Tuesday, 28 February at the Cairo Citadel. The concert was produced by prominent Egyptian musician Fathy Salama, and organised by the American Embassy in Cairo, as part of the American Music Abroad programme. El Wedidi opened the show with a solo performance, before inviting the three-woman ensemble Mazaher, comprised of Om Hassan, Om Sameh and Nour El Sabah, to join her on stage. Together they performed some of the independent musician’s songs, before the ensemble launched into a show of traditional Zar music, accompanied by El Wedidi on daf. The Zar genre is frequently associated with “exorcism” ceremonies, but is not limited to this context; the ensemble rather brings to light this distinctly African heritage in Egyptian music. After the Mazaher ensemble left the stage, El Wedidi went on to perform one of her most popular songs, Tedawar Wa Terga3 (Turn Around And Come Back), to which most of the audience knew the lyrics by heart, and heartfully sang along. The musicians then proceeded to surprise her fans with a new song. The song is titled El Nas Namet (The People Slept) and is a musical adaptation of Nabil Abdel Hamid’s poem of the same name. The singer’s beautiful rendition of his words was received with a thunder of applause. While studying Oriental Languages at Cairo University, Egyptian independent singer and musician Dina El Wedidi joined El Warsha Theatre Troupe, where she learned to sing a variety of traditional genres and began to explore her vocal potential with the help of her tutor, Maged Soliman. She also engaged in numerous workshops with independent musicians from Egypt and elsewhere, including Fathy Salama and singer-songwriter Kamilya Jubran. The singer is known for her innovative approach to traditional Egyptian music, to which she adds a touch of modernity. In 2013, she took part in the Nile Project, a musical and environmental initiative that brings together musicians and thinkers from the Nile Valley, and later received the Rolex Arts Initiative for Promising International Artists Award, which gave her the opportunity to be mentored for a year by prominent Brazilian singer Gilberto Gil. More recently, in the past two years, El Wedidi has become the lead performer of an ensemble fusing local and global styles of music, which she describes as a “growing project”. El Wedidi closed off her solo performance with another fan favourite, Sokoon (Stillness), before calling African American violinist Chelsey Green and her band The Green Project to the stage. Green began her performance with a rendition of the song “my favorite things” from the musical Sound of Music, accompanied by the guitar, bass, keyboard, drums and percussions. Although the melody remained very recognisable, this unusual blend of styles breathed new life into the well-known tune. A classically trained violinist, Green was born into a family of jazz and funk musicians, and began her performing career at the age of five. She studied classical music in the Houston public school system, and went on to receive a scholarship for music studies at the University of Texas, Austin, from which she graduated. The musician then pursued a Master’s Degree in Viola Performance at the Peabody Conservatory of the Johns Hopkins University, before obtaining a doctorate from the University of Maryland, College Park. Her band, The Green Project, released their debut album “Still Green: The EP,” in 2012. The band’s innovative blend of violin and viola with traditional techniques from genres such as jazz, funk, soul, hip-hop and R&B was met with great critical acclaim. The violinist performed a number of popular songs by a variety of artists, most of whom are contemporary African American musicians such as Beyonce, Rihanna and Bruno Mars. It was not until the third song on her set list, Blackstreet and Dr.Dre’s “No Diggity”, that Green sang into the microphone, blowing away the audience with her deep, soulful voice. The Green Project also performed one of their original songs, Road Trip: infectiously upbeat, the song lived up to its title. El Wedidi and The Green Project are both known for their innovative approach and renewal of their respective national musical heritages. While the first gives a modern feel to traditional oriental music, the second harmoniously brings together jazz music, classical music and other contemporary genres. After Green put an end to her solo performance, Grammy-awarded Egyptian musician Fathy Salama came to the stage and, under resounding applause, thanked all those involved in the event, before calling back the performers. El Wedidi, Chelsey Green and the Mazaher ensemble performed several compositions which they developed together under the supervision of Fathy Salama, incluidng an arrangement of Sayed Darwish's Shed El Hezam and the famed jazz standard Caravan. Finally, in a spectacular fusion of all their respective musical styles, the artists closed the show with El Wedidi and Mazaher’s hit song, Dawayer. A second Hakawateya performance is set to take place on 3 March at the Bibliotheca Alexandrina.